Located in the of Fujiidera, Osaka Prefecture, this is a nunnery of the ancient Shingon Buddhism dedicated to the eleven-faced Goddess of Mercy,a national treasure elaborately hand-carved by Sugawara Michizane,845-903,a noted scholar and politician in the early Heian era. When Shotoku Taishi, a pious Buddhist himself, decided to build a nunnery in this place, Haji, a local hereditary propagandist of Buddhist cultures, donated his vast land, and the seven buildings including a five-storied pagoda and a golden pavilion were completed. This cathedral was first called Haji Temple, and was later renamed as Domyoji after the death of Sugawara Michizane. 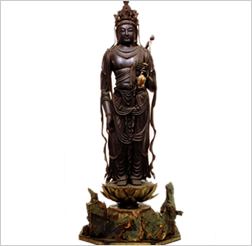 It was a treasure house of numerous images of Buddha, scriptures, arts and crafts, medicines, etc. 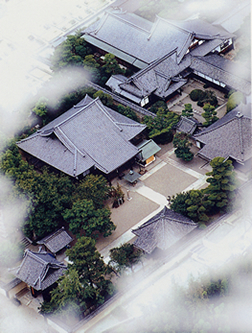 In the age of civil wars in the medieval period in the Japanese history, the temple was burnt down, but it was missed by many people, and restored by the efforts of Oda Nobunaga and Toyotomi Hideyoshi, and protected and authorized by the shogunate of Tokugawa generation after generation. In 1872, by the order of separation of Buddhism and Shintoism, Buddhist edifice and halls were removed from the Shinto shrine, and moved to the expanded grounds of the temple, and in 1919, Main Pavilion was erected, and Treasure Tower was later added to complete the present from. Domyoji is one of the few nunneries surviving the history of 1300 year since establishment, and we are very proud of the religious spirit of all the people who supported this temple. Copyrigth 2005-2019 Domyoji.All Right Reserved.